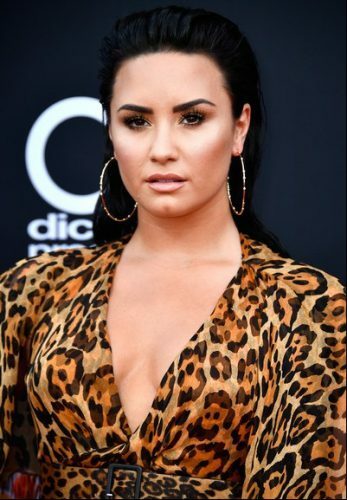 Demi Lovato wore her hair slicked back to show off her Christian Dior animal print dress to the 2018 Billboard Music Awards. The wet look was created by celebrity hair stylist Cesar Ramirez using BioSilk hair products. 1. First, he washed hair with BioSilk Hydrating Therapy Moisturizing Shampoo and Conditioner. 2. After he towel-dried the hair, he evenly applied BioSilk Silk Therapy Beach Texture Spray to add body and texture. 3. Using a flat brush and BioSilk Titanium Blow Dryer, he directed all the hair back and away from the face for controlled volume and to create a tousled slick back look. 4. Once the hair was dry, he layered BioSilk Glazing Gel in small sections from the bottom to the top of the head and brushed each section back. 5. While applying the gel, he set the hair with its natural texture in clips to create the ultimate wave. 6. To set the look, he attached the diffuser to the blowdryer and dried the hair on low heat. 7. Once dried and set, he removed the clips and finished the look with BioSilk Silk Therapy Finishing Spray.